and easier than ever to administer! 100% of your teachers can complete the 60 minute course online – and satisfy the new requirements in the commissioner’s rules …all with minimal effort by your administrative & training staff. TAC 150.1007. (a)(3) At least three weeks prior to the first formal observation, all teachers to be appraised under the PDAS shall be provided an annual review of this subchapter and district policy regarding teacher appraisal. Easy to Setup, Your teachers could start today! Just purchase seats and send a registration code to your teachers. They can then immediately begin taking the course at their convenience. The course takes about 60 minutes to complete. Participants can take the course from anywhere. All a participant needs is a broadband internet connection, a computer with a modern web browser and some speakers or headphones. Lots of Interactivity – This is not your typical “Sit-N-Get” Training! 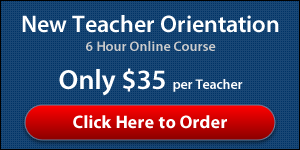 The course is filled with interactivity, video, and engaging learning methods. This is not just watching a video or reading online text! One button click reporting for District Administrators to monitor & ensure 100% compliance. Each course administrator has access to view PDF and Excel reports summarizing the participants’ progress. Never has administering a course for your district or campus, been easier and more automated! Now participants who self register will receive their username and password straight from the website and can begin taking the course IMMEDIATELY! The “Course Summary Report” gives you a complete picture of your registered participants and their course progress, grouped by school. You can see which modules participants have completed and if they’ve completed the entire course at a glance. Reports can be downloaded in PDF or Excel format, or delivered via email attachments. Content Content is standardized directly from the source: The experts at TEA, Region 13 and the curriculum team. The information is interpreted by the individuals giving the training. Information is often left out or communicated incorrectly. Professional Development Days Optional: Some districts have participants take the course over several sessions on their own time. Requires one PD day. Cost $275 per campus for all teachers from the campus. Given the teachers’ time, the trainer’s time, the cost of delivering the PDAS review using traditional methods is around $1,200 per campus. Accountability & Tracking Assesses learning, measures progress and reports results via downloadable PDF reports. The traditional face-to-face delivery provides a record of attendance, but no measure of learning or understanding. It’s typically a “Sit-and-Get” approach. Training Coordination District sign up and teacher registration is fully automated and very easy to manage. Teachers can take the course on their own schedule as needed at any time in the year. Face-to-face delivery requires significant time for preparation of materials, coordination of location, and communication to teachers. If teachers start late, they need to attend a make-up training that is additionally difficult to coordinate. 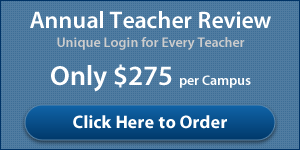 Access to Training Using the assigned username and password, teachers can access the course and all the resources presented for the whole year at any time. All the videos are viewable at any time online. The training is a one-time event. Teachers have to rely on the manual and the notes they took during the orientation.